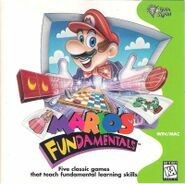 Mario's FUNdamentals, originally released as Mario's Game Gallery, is a compilation game in the Mario franchise, published by Interplay Entertainment Corporation and developed by Presage Software Inc. for PCs running Microsoft Windows. Exclusive to the United States, it was originally released in 1995, and later reissued and retitled in 1998, with Brainstorm Entertainment developing and Mindscape publishing this re-release; a version for Macintosh computers was published by Stepping Stone. This game marks the debut of Charles Martinet as Mario's voice actor in a video game, who has since become the official voice actor for Mario. Five traditional games are included: checkers, backgammon, Go Fish, dominoes, and "yacht", a version of Yahtzee. Players play against Mario in these games, though at times they can also play against Bowser. Gameplay for all the games is similar to their real-world counterparts, though pieces are altered to be themed after the Mario universe. Both versions of the game have received mixed reception. Upon its initial release, various publications found it to be a good educational game: The State and The Miami Herald praised it for "providing fun for the whole family"; and the Los Angeles Times said that it would appeal to younger gamers. Much later, the game was negatively received by authors David Wesley and Gloria Barczak, who labeled it and the other Mario games manufactured by third-party publishers in the 1990s, which were made without the supervision of Nintendo, as "a flood of ill-conceived Mario spin-offs" that almost destroyed the Mario brand. The main menu of the game, with the alternative name Mario's Game Gallery. A game of checkers, with checker pieces replaced by Yoshis and Koopa Troopas. Mario asking for Big Boo cards to the player in Go Fish. Gameplay of Yacht, with the player's HUD keeping track of the score for both players. In Go Fish, Bowser's name is misspelled "Bowzer". Mario refers to Toad by a pet name, "Little Toadie". This nickname originates from the 1993 Nintendo Character Guide, a set of guidelines and information given by Nintendo of America to licensing partners. ↑ Wesley, David; Barczak, Gloria (2010). Innovation and Marketing in the Video Game Industry: Avoiding the Performance Trap. Gower Publishing Ltd. ISBN 9780566091674. This page was last edited on August 14, 2018, at 03:44.